A sumptuous recording featuring musical pinnacles of the French romantic. The four ‘symphonic poems for voice and orchestra’—Psyché Op. 33, Les Djinns Op. 35, Eros Op. 37 and Ballade du désespéré Op. 61—by Vierne are all world-premiere recordings. Renowned as organist of the Cathédrale de Notre Dame de Paris, the tragedies of Vierne’s personal life are shot through these extraordinary unpublished pieces. Accompanying Vierne’s Poems on this release is Chausson’s masterpiece of nineteenth-century French mélodie, Poème de l’amour et de la mer, recorded here for the first time by a tenor, the voice for which it was originally written. Steve Davislim follows his successful Melba recordings of Saint-Saëns, Richard Strauss, Britten and Schubert with this important CD. These bitter words by Vierne show his despair at the end of a life in which the brilliant accolades he received as an organist and composer were a poor compensation for a life beset by personal and family crises, which were often reflected in his music. Louis Vierne was born in Poitiers on 8 October 1870. Being vision impaired since birth, he received his first musical education at the Institute for the Blind in Paris. He then went on to the Paris Conservatory where he studied the organ with César Franck, then Charles-Marie Widor and, in 1894, brilliantly won first prize. In 1900 he was appointed principal organist at the Cathedral of Notre-Dame de Paris, a post he held until his death on 2 June 1937 while playing at the organ console. Apart from music for the stage, Vierne’s works touch on every genre. For much too long he has been remembered only for his organ compositions, especially the six monumental Symphonies. While they are undeniably a pillar of the organ repertoire in the first half of the 20th century, the most intense, most moving, indeed most despairing vision Vierne has to convey should perhaps be sought in his Symphonie for orchestra and his chamber and vocal music. His vocal compositions, which constitute the largest part of his output, often mirror his troubled personal life and the three singers who shared it. In 1899 Vierne married Arlette Taskin, with whom he had three children (only one survived him). He divorced her in 1909, a very painful event for him as divorce was condemned by both society and the church at that time, especially for a man who held such a high religious post. In 1910 he began a relationship with Jeanne Montjovet, often appearing in recitals with her. She was the inspiration for his first great song cycle, Stances d’Amour et de Rêve (1912). In 1915 this singer also departed, leaving him in a state of utter confusion while at the same time suffering increasingly painful eye trouble. This forced him to leave Paris for four years in Lausanne, Switzerland, where he was treated by the ophthalmologist Samuel Eperon. These years of dreadful physical suffering also saw the deaths of his son Jacques and his brother René on the battlefields of the First World War. Such tragic events, however, in no way diminished Vierne’s creative genius. Between 1916 and 1920 he produced some of his most poignant masterpieces, such as Spleen et Détresses, a cycle of ten songs on some poems of Paul Verlaine: a poem for piano, Solitude, and above all the wonderful Quintette for piano and strings (1918) dedicated to the memory of his son, one of the most beautiful compositions in French chamber music. A third important female presence, Madeleine Richepin, changed the course of Louis Vierne’s life, this time in a more positive way. This young singer, 28 years his junior, did her best to make the musician’s life easier by giving him financial security and a lifestyle which allowed him to devote himself entirely to his art right up to his death. Thanks to her care, between 1921 and 1934 Vierne was able to give a considerable impetus to composition, resulting in some of his major successes including several song cycles dedicated to his benefactress. In addition to his lyric legend Praxinoé and his numerous songs, Vierne’s secular vocal works include four substantial poems with orchestra. This kind of composition, halfway between the art song and the symphonic poem, is most notably represented in France by Camille Saint-Saëns (La Fiancée du timbalier), Alfred Bruneau (Penthésilée), Gustave Samazeuilh or Charles Koechlin. However, the one to put his stamp on the genre is undeniably Louis Vierne with the four works on this recording plus a lyrical ode, Dal Vertice (1917), on a text by Gabriele d’Annunzio. Les Djinns Op. 35 (The Djinns) (track 1) was composed in the autumn of 1914. Here Vierne sets Victor Hugo’s poem of the same name to music. It is taken from the collection Les Orientales and has a very distinctive form: beginning with monosyllabic lines, Hugo adds a syllable with each verse up to 10, and then reverses the process. This famous poem had already inspired Gabriel Fauré (a short choral piece), and especially César Franck with a symphonic poem for piano and orchestra, composed in 1884. Subtitled ‘symphonic poem with voice’, Vierne’s composition strikingly portrays the atmosphere of dread, then terror, in Hugo’s verse, which describes the flight of the evil spirits. From the beginning, the composer gives the leading role to the orchestra as the driving force that will present the main thematic elements, the singer essentially being assigned the role of narrator. Introduced by a few low notes followed by a kind of lament with descending chromatics, the tempo is slowly built up then, from the third verse, reveals the main theme, in D minor, which in various guises will dominate the piece to the end. The atmosphere changes at the ninth verse: suddenly the swarm is interrupted, giving way to a fervent prayer (Prophète, si ta main me sauve de ces impurs démons des soirs [Prophet, if your hand saves me from these impure demons of the night]) with melodic fervour worthy of Gounod. The previously passive role of the narrator now becomes active for this stirring entreaty in E Flat major, after which the initial tempo begins again and the main theme reappears. The nightmare slowly fades and this third section takes the shape of a long decrescendo. A repeat of the beginning, a short coda and everything fades away into silence. It is likely that Les Djinns was inspired by the voice of Jeanne Montjovet. The dedication, however, is given to another great French soprano, Germaine Martinelli, who gave the first performance of the work in Paris on 8 March 1925 with the Orchestre des Concerts Lamoureux under the direction of Paul Paray. In 1916 the composer came back to the form of the poem for voice with Eros Op. 37 (track 22). He set to music a fragment from Les blouissements, a collection by the Countess Anna de Noailles. She was a poet from the Parnassian School, excelling in the expression of a pagan sensuality in which the sadness of unfulfilled love and the fear of death are just below the surface. Louis Vierne’s vocal works written after 1920 are all dedicated to his muse and benefactress, Madeleine Richepin, whose marriage to the cancer specialist Lucien Malle left the composer very much at a loss. It was therefore in a state of great confusion in the autumn of 1931 that he composed Ballade du désespéré (Ballad of the Despairing Man) (track 3), a lyric poem from Les Nuits d’hiver by Henri Murger. He numbered it ‘Op. 61 and last’, (it will nevertheless be followed by a Messe basse for organ Op. 62), dedicating it once again to his patroness. As it had not been scored at the time of Vierne’s death, the work was orchestrated by his pupil Maurice Duruflé and given its first performance on 8 April 1945 by Marcelle Bunlet and the Orchestre des Concerts Lamoureux conducted by Eugène Bigot. Ballade du désespéré faithfully follows Murger’s poem, taking the form of a dialogue between the poet and another person who wants to come into his house. The piece begins with an impressive orchestral introduction. Very loud, harsh, low chords symbolise the knocking at the door. A rising melodic line in the brass is followed by a solemn, almost religious motif which seems to represent the call of fate, then by a horn lament with heartrending harmonies. These last two themes, leitmotivs really, are present in different guises to the end of the work. The singing begins with a kind of recitative: the poet keeps asking the man’s name and is answered by entreaties to be let in. The stranger then claims several identities: he is fame, love, wealth and youth. The music is opulent and voluptuous in turn, and is formulated in brief sequences punctuated with the poet’s determined refusal to grant hospitality. 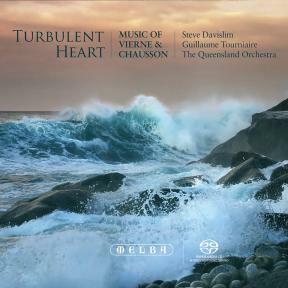 Transcending Murger’s rather facile morbid sensibility, Vierne creates very moving musical correspondences to the poet’s moods, with which he no doubt identified. Expressing in turn rebellion, lost illusions, then resignation in an expressionist atmosphere quite uncommon in French music of that time, Ballade du désespéré is one of the composer’s strongest and most moving works. It would be difficult to imagine two lives more different than those of Louis Vierne and Ernest Chausson. Chausson was born in Paris on 20 January 1855 and led a perfectly harmonious existence from all points of view until his death in an accident at Limay on 10 June 1899. Chausson grew up in an extremely cultured milieu, and developed a great love of the arts and literature at a very young age. After graduating in law, being admitted to the bar of the Court of Appeal, in 1877 he decided to devote himself to music. A former pupil of Jules Massenet and a disciple of César Franck, he mixed with musicians like Vincent d’Indy, Eugène Ysaÿe, and above all Claude Debussy. He was also a close friend of poets and painters such as Stéphane Mallarmé, Maurice Maeterlinck, Odilon Redon and Maurice Denis, all of whom frequented his home in the Boulevard de Courcelles, an important cultural meeting place at the end of the 19th century. Often considered as ‘a link between Franck and Debussy’, Chausson appeared as one of the musicians closest to the symbolist aesthetic. He has a lot in common with the Symbolists, as much through his literary and artistic tastes, and his fascination for Wagnerian drama—embodied in his opera Le Roi Arthus—as through the expression of a lyricism full of mystery and dream, but capable of expressing poignant intensity. This can be seen in his Poème for violin and orchestra, his Symphony in B Flat major, or the wonderful Concert in D minor for piano, violin and string quartet. Vocal music occupies a major part in his output, with a total of 51 songs that are remarkable for the quality of the poems he has chosen (notably writers such as Verlaine, Maeterlinck and Moréas), as well as for the subtlety and depth of their expression. Chausson was a friend since youth of Maurice Bouchor (1855–1929), a poet and playwright passionately fond of music, who helped establish the practice of choral singing in French public schools at the end of the 19th century. It was from some of Bouchor’s Chansons de l’amour et de la mer that Chausson took material for his Poème de l’amour et de la mer (Poem of love and of the sea) from 1882 onwards, however it was not completely finished until 11 years later. Although constructed as a whole, the work consists of two distinct parts separated by an interlude for orchestra. The first section, La fleur des eaux (The flower of the waters) (track 5), presents two cyclical motifs. The serenity of the first in G major is quickly dispelled by anguished harmonic progressions, then by a troubling melodic line, (accompanying the evocation of lilacs in flower), which becomes the keystone of the composition. Illustrating nostalgia for the happy times of yore in its poignant melancholy, it forms the basis for the material of the interlude (track 6), ‘slow and sad’, an instrumental prefiguration of the last part. The beginning of the second section, La mort de l’amour (The death of love) (track 7), seems to bring back a surge of optimism destined, however, to be short-lived. A form of funeral march played by the orchestra, then an anguished passage—the poet expresses the confusion in his mind, followed by the inexorable loss of his beloved—leads on to the conclusion. The solo cello sings the main cyclical motif, soon joined by the voice mourning happy days gone forever. Despite a fleeting evocation of spring just ended, the heartrending lament accompanies the work to the very end: le temps des lilas et le temps des roses est mort à jamais [the time of lilacs and roses is gone forever]. A last efflorescence of the theme, and everything dies away in a last chord in D minor. These days Poème de l’amour et de la mer is usually performed by female singers, but it was written for a tenor voice, as the printed score expressly states. This recording therefore restores the original version as the composer intended.